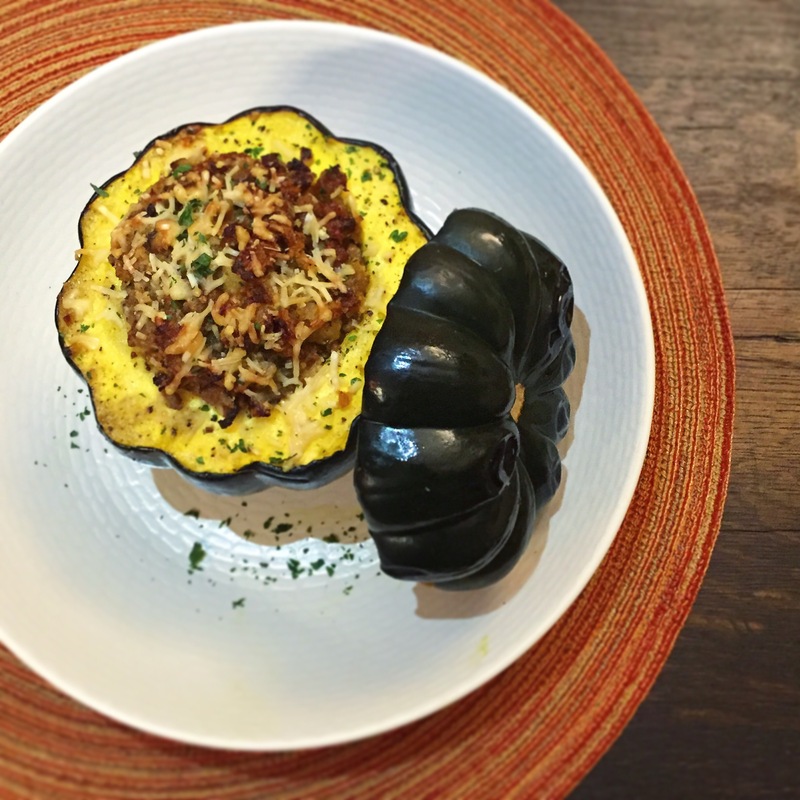 The Stuff Dreams are Made of: Stuffed Acorn Squash – Pao Says, "Open Wide!" All around us, there is change occurring. The leaves are turning from summery green to vibrant hues of fire red, orange, and yellow. A crisp chill is quickly creeping into the air. Basic B’s everywhere are breaking out their Ugg boots and hugging their PSL’s close to their hearts. Fall is in full swing and that means something quite crucial: its peak season for squash. In my kitchen, I’ve been playing around with butternut squash, spaghetti squash, and, most recently, acorn squash. Last night, I made a sausage and apple-stuffed acorn squash, and it was all kinds of warm, savory, sweet, and all-around delicious. The key to this dish is getting some quality sausage. We got ours from Harvey’s in Union Market, here in DC. It was a smoky, bacon sausage and it was incredible. The smokiness of the sausage was a great complement to the sweetness of the squash and the tartness of the green apple. However, I would say that a slightly spicy sausage would also play well with this dish! Its a really pretty, very simple dish, perfect for an intimate night or for entertaining! Preheat the oven to 400 deg F. Cut a piece of the bottom of the acorn squash off (so that it can stand without rolling over). Cut the top 1/3 of the acorn squash off (with a sharp knife- it can be tough, so be careful). Set the top aside. Scoop out the seeds and pulp from the inside of the squash, place the squash and tops on a baking sheet, and drizzle the inside of it and the flesh part of the top with olive oil. Season liberally with salt and pepper, and pop in the oven for 30 minutes. While the squash bakes, coat the bottom of a hot skillet with olive oil (med-hi heat). Sweat the onions and apples. Add in the mushrooms, the sage and thyme, and season with a bit of salt and pepper (pinch of each). Once the onions begin to become a bit translucent, add in the sausage. If the sausage is encased in links, cut through the encasing on the sausage length-wise, and take the meat out from inside, then break it up into the skillet. brown the meat, ensuring to break it up, while it cooks, with a wooden spoon. Once the meat is cooked, put the mixture into a bowl and let it cool for a few minutes. Add in the breadcrumbs, the cheese, and the egg (beaten), and mix well. The squash should be (almost) ready by now! Once the timer goes off, take the squash out of the oven and stuff them with your sausage-apple stuffing. Top with a sprinkle of parmesan and a drizzle of olive oil. Bake at 400 deg F for another 20-30 min- watch for the cheese turning golden-brown. Once its ready, set the stuffed squash aside to cool for 5 minutes before digging in. I plated with the top third of the squash leaning against the side of the stuffed portion- beautiful presentation, if I do say so, myself!